Amid the heavily polluted Hong Kong air, some builders are adopting distinctively attractive measures aimed at clearing the air - green walls. Steven Chen reports. Despite recent efforts from the powers that be to reassure the masses that all is well, it's hard to dispute that Hong Kong's air leaves much to be desired. It's not surprising then to find a recent survey indicating that a large number of locals and foreigners alike are considering moving to greener pastures, citing the city's air as one of their main concerns. But for those determined to stay, or those who have no other choice, what are the alternatives? The Environmental Protection Department tells us that we spend more than 70 percent of our time indoors, either at work, at home or in leisure venues. Might it make sense then to do more to control the air quality of our interior spaces? Some businesses may be doing just that, as part of a growing awareness of the importance of living healthy, environmental sustainability and energy conservation. More and more of them in Hong Kong are installing "living" walls in offices, hotels and other interior spaces. 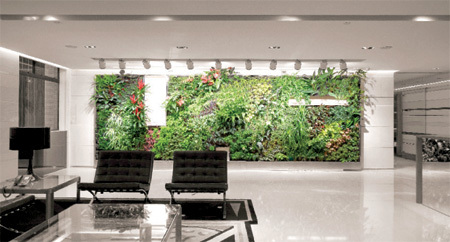 Already established in the United States and Europe, these plant walls, "vertical gardens" and other oases of green are capital investments that may cost two to five percent of the total cost of an interior fitout, but can reduce energy costs by 20 percent over the life cycle of the space, arguably making them a wise financial choice. Plant walls are comprised of a rigid support structure with or without subdivisions in which sits soil or an underfelt and then the plants themselves. Like horizontal gardens, they require continual watering and therefore an irrigation system and, if not located near natural sunlight, artificial lighting. Additional requirements include a drainage system, an electric pump and a nutrient supply. Maintenance is also needed, by either a paid service contractor or very dedicated member of staff. But while such installations are slowly sprouting in the city, as occupants, both in the private and public sectors, become more aware of green living, how likely are they to become widely used? "It really depends on the context," says John A. Herbert, principal and founder of Kelcroft, a Hong Kong-based consulting body that specializes in advising on "green" living and energy conservation. 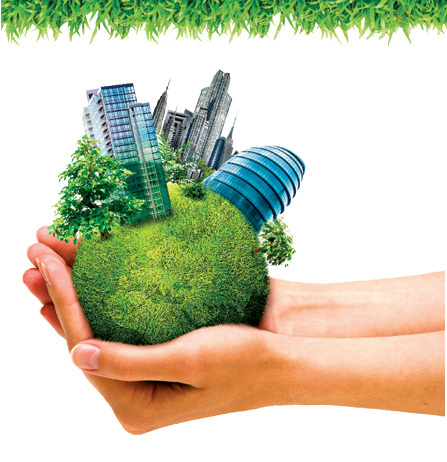 "The priorities of the owner/occupier or tenant and the developer are different. Developers are not the end users of their buildings, so they want to minimize their outlay. Demand and the wider use of plant walls will need to come from users who want to improve the quality of their space and see them as a long-term investment. In the business sector, this will be from corporate headquarters, whose leasing policies determine what kinds of spaces its staff work in." One company that has done exactly that is Langham Hotels, in its Eaton Smart, formerly the Eaton Hotel, which has installed one of the city's first plant walls as part of a HK$12 million refurbishment of its main lobby, as part of an overall "green" program that will be applied to its properties in Thailand and a yet-to-be-opened site in Shanghai. "The wall creates a pleasant, tranquil, atmosphere. It's a big part of the 'natural' feeling of the lobby," says Agnes Ma, Eaton's assistant communications manager. "In our location, there are many buildings around and a lot of traffic. We wanted to create an atmosphere that soothes guests when they enter." The six-meter-high-by-eight-meter-long installation sits three or so meters above the lobby floor and receives abundant sunlight from a north-facing glass wall directly opposite. Comprised of 3,600 Sanserviera Trifasciata or Mother's Tongue plants (huiweilan), the wall absorbs carbon dioxide, exudes oxygen and is intended to clear toxins from the air, says the hotel's information sheet. Advocates of indoor plant walls say just one plant is able to scrub indoor pollutants from the air in a 10 square-foot area, meaning that Eaton's large array would be more than effective in improving the air in its lobby. While she admits no accurate measurements have been taken to determine what changes to air quality may have been made, "the air does feel cooler and the lobby more comfortable", says Ma. Along this same lines are two walls in projects recently undertaken by local architectural firm Ronald Lu and Partners (RLP), one in its own lobby in Wanchai, the other in a residential clubhouse elsewhere in the city. 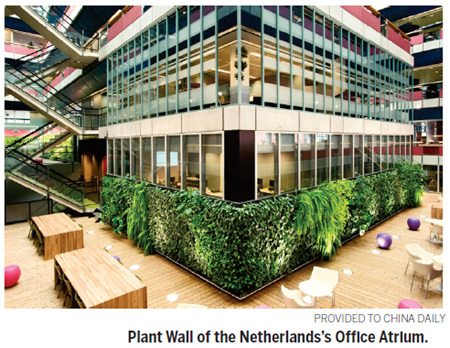 Its office wall is a modest 13 square-meter "vertical" garden built in collaboration with French botanist-turned-artist and vertical garden guru Patrick Blanc. Paris-based Blanc's fluid design incorporates 353 individual plants comprising over 50 different species of plant that are intended to absorb common indoor air pollutants including formaldehyde and nitrogen oxides in addition to their normal actions. The plants are embedded in an underfelt through which is pumped nutrient-rich water at intervals determined by a computer-controlled timer. Because the garden is at right angles to the window wall, an overhead lighting system has been installed to replace the sunlight that would normally be received. "We know that the use of these gardens improves the air quality. It also gives energy savings as it lowers temperatures by cooling the air and absorbing heat, thus reducing the need for air-conditioning," says M. K. Leung, a senior associate and RLP's deputy director of sustainable design. With the government placing increasing importance on environmentally friendly buildings through its Building Environment Assessment Method (HK BEAM) and BEAM Plus certifications, such walls may well be embraced by businesses as the private sector is encouraged to follow the government's lead in obtaining a BEAM rating for its buildings, "which will include credits for the quality of indoor air", says Leung. "The benefits are there, what hasn't been done and needs more work, is quantifying these benefits for people to see. Once they see the benefits they'll be more interested in adopting these systems." While a study sponsored by NASA and carried out by the Associated Landscape Contractors of America (ACLA) in 1989 appeared to support the efficacy of selected plants in detoxifying air and, by reasoning, the overall quality of the indoor air in which they are used, it did have its critics. Problems with the study and reported results, which have been seized upon by the landscape and other plant industries to develop markets and promote products, are due to the way conclusions were drawn from tests done and how they differ from real life environments, said Hal Levin of the Building Ecology Research Group, a US-based organization that provides consulting on building and environmental issues, in a report assessing the work. In particular, even an inspection of only the best test results, suggests that the plants were only able to remove a fraction of the indoor pollutants that can be removed by the normal action of ventilation in an air-conditioned space in most buildings. Their low effectiveness in the closed spaces tested, when extrapolated to real-life interiors, suggested a impracticably large number of plants would be needed to achieve even these anemic results. Levine also notes that it is the passage of air through the soil, which contains micro-organisms, that performs most of the cleaning effect of the air rather than the actual plants themselves, making correct air flow a must in achieving any benefit at all. However he does agree that plants are effective in removing CO2. The actual benefits of interior greening are mixed agrees Herbert, although, like Leung, he offers a more positive view. "While plant walls can bring benefits to the interior space, their use and real value can be no value at all if not used properly. They require nutrients to grow, they require irrigation and therefore a great deal of water to keep them alive. Then there is the power consumption to pump water into the system and pass air over the soil. The combined use of all these resources may provide no net benefit to the environment." "The quality of the air at the human level, from the floor to about 3.0 meters is what counts, so any installations need to be designed to serve this zone. Ventilation and air ducts need to be correctly placed to ensure air passes through the wall at floor level and extracted overhead." With dubious science and the danger of poor implementation on one side and unquantified advantages on the other, are plant wall pioneers paying for style rather than substance? No, says Herbert, as such installations "definitely have benefits". "Interior plants produce oxygen, reduce CO2 and do create a psychologically pleasing environment." And when designed and sited correctly, including "at entrances to buildings, they lower the temperature of air entering the building and absorb solar radiation, which will definitely reduce energy use".